We’ve got so many tomatoes this year that they are literally dropping off their vines! We’re having a little trouble harvesting them fast enough! Nice problem to have, huh? At least if you are a gardener, that is! We’ve had a wonderful and BLESSED spring’s worth of rain and (until recently) we’ve received a nice weekly dose of summer water from the skies! Perfetto! None of our tomatoes cracked; none of them came down with any disease or pests . . . we’ve had just a perfect summer’s bounty of ruby-red tomatoes! Seriously, some of my family think that I’m just a nut-case with so many tomato plants that I plant every spring! But come winter, when all there is in the marketplace are those orange-ish, plastic, rubber tasting tomatoes . . . this is when I have the last laugh (but in a good way)! So come on over and I’ll open a jar of summer freshness to make your mouth water big time when it’s sub-zero temps outside! One key thing to remember! 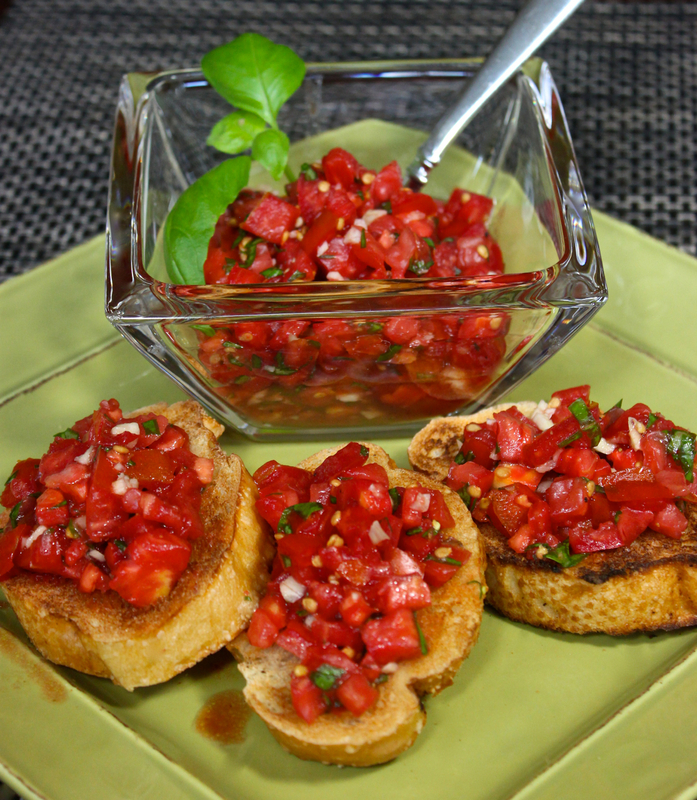 Make your Bruschetta in advance so that all of those lovely fresh flavors marry together perfectly! Time is their advantage while you prep for your guests! With grilling the chicken (or fish if you prefer), this recipe is just so much more healthy for us! In the winter time, I lightly bread the chicken breasts in Italian-flavored panko breadcrumbs, since it is something that my German-Scotch husband prefers . . . the result is still light, but much more appropriate for heavier winter fare! If you like, you can add a slice of your favorite Italian cheese before topping everything off with the fresh Bruschetta. And if you don’t want to grill your chicken, you can always bake it in the oven or sear it nicely in a hot skillet on the stovetop……whatever is easiest for YOU! As you can see, I really like to layer on the Bruschetta. This way you have plenty to lather on top of some toasted, garlic-rubbed Italian bread slices! So don’t forget to serve with some freshly toasted Italian bread slices! If you’ve got some extra garlic cloves on hand, make sure that you rub the garlic cloves all over the bread slices! I’ve been so blessed to have my family in Modena, Italy (where authentic D.O.P. “Aceto di Balsamcio” — Balsamic Vinegar is produced) and who have shared some of their precious, ancient barrels of Balsamic Vinegar with me. I use this old, sweet vinegar with reverence and in sparing amounts! In my famiglia’s Modena, Italy home, I share these wonderful photos of life in Modena, Italy! 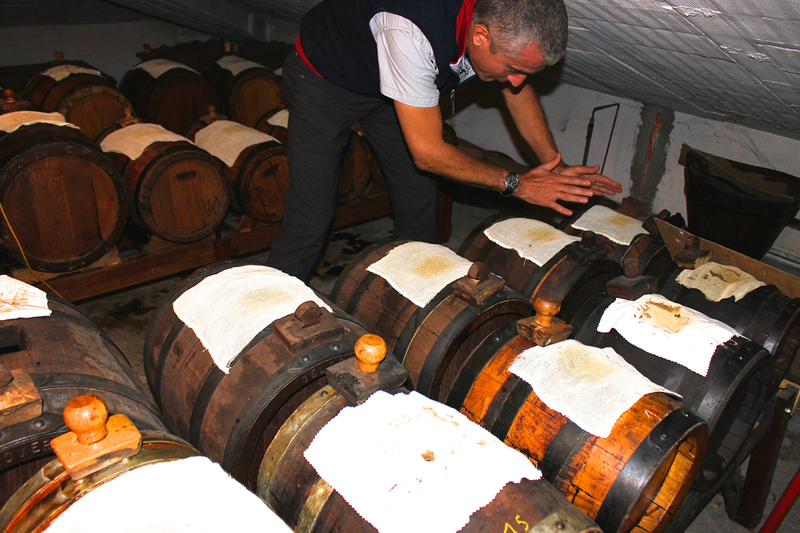 my cousin, Enrico, with his aged barrels of aceto di balsamico (balsamic vinegar) in Modena, Italy . . . the only authentic and approved location of production by the country of Italy (D.O.P)! Brush the chicken with melted butter or olive oil. Sprinkle herbs all over each breast. Grill until desired doneness; approximately 5 to 8 minutes on each side. Be careful not to overcook. Place on a serving platter with freshly-prepared Bruschetta (recipe through link provided above) ladled on top of chicken. Optional: In winter when we eating a bit more heavily, blend the Italian herbs into 2 cups Italian-herb-based panko crumbs. Brush the chicken with butter/oil. Cover the buttered breasts on all sides with the seasoned panko. Grazie mille, cara Claudia! Happy New Year to you too! 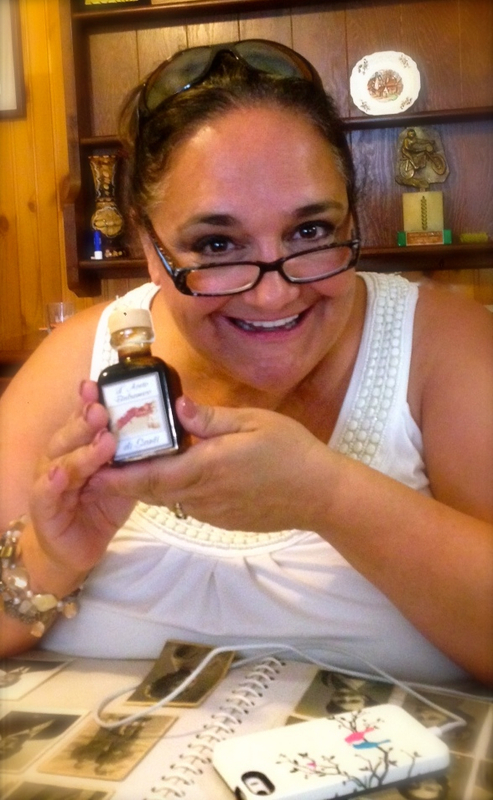 I have been to Modena and toured a lovely family home where they made balsamic vinegar . It was so interesting to learn about the process. I was there 3, maybe 4 years ago during a huge snow storm. It was absolutley breathtaking covered in snow. The host provided us with delicious warm drinks as we toured and learned about the family business. I would not take for the experience. 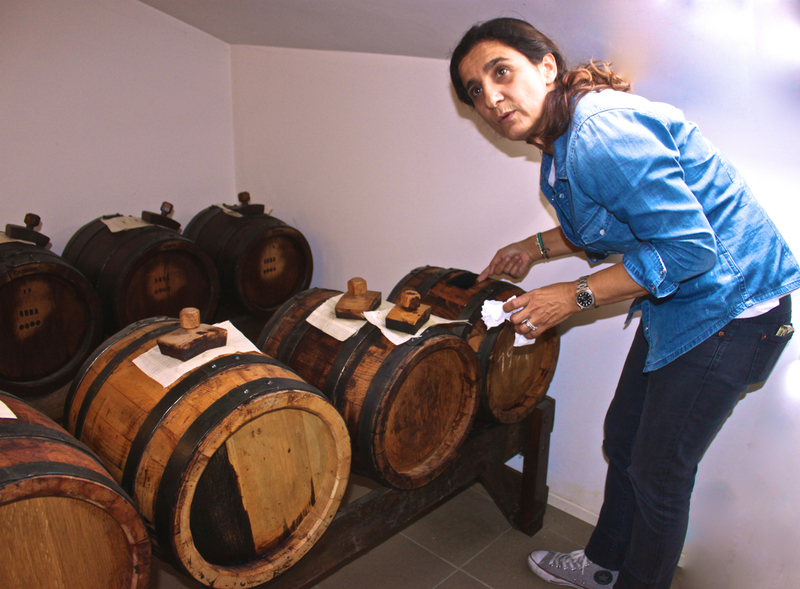 Thanks for your visit to my blog; yes, Modena and it’s tradition of making authentic balsamic vinegar is indeed a culinary treat to visit! Thanks Pam! I’m already yearning for this coming tomato season! Winter always seems to drag on too long! May you have a beautiful and blessed new year in 2016! This screams FRESHNESS. You gotta share some tips or tricks on growing tomatoes. You’re so sweet Angie! Thank you! Looks delicious Roz and I appreciate the pronunciation lesson. You’re welcome Larry! May Bev and you have a great 2016! I grow so many tomato plants in the summer too. We had such a cool early summer that it’s taking longer than I’d like for them to start turning red. The cherry tomatoes are just starting to ripen. I can’t wait to try this recipe and I’m also going to get that classic bruschetta recipe too! Thanks Susan! It’s a labor of love every summer; but all of the fresh tomatoes are so worth it! Oh, Roz, I’m so envious of your tomato crop. I think some critter has run off with all of ours!!! But I will find some decent ones at our farmers’ market and whip up your chicken bruschetta. It looks AMAZING. It’s my favorite plant to grow (tomato plants) Liz…..each year, I add more plants and more varieties. An Iowa farmer must have been in my family somewhere . . . ya think? You are spot on with that thought Rebecca! Healthy and super, uber-delicious! Summer is all about fresh vine ripe tomatoes. Aren’t you lucky to have such a wonderful crop this year…sounds like you had the perfect growing season this year. Your bruschetta chicken looks delicious. Since we are moving, there really wasn’t a point in my growing a large tomato garden this year. Awe, thank you so much Karen for your generous comment! It was yummy, but better yet, it was healthy with flavor — something that is so hard to achieve in my never ending efforts to lose the extra poundage! This looks like the perfect summer recipe, Roz! That is great that your tomatoes came out so good this year. I agree with Angie above that it would be wonderful if you shared some tomato gardening tips. I’m not sure if they would apply to Arizona weather, but you never know. I miss our garden this year. But I can still buy tomatoes and would love to try your sister-in-law’s bruschetta over grilled chicken. Thanks for sharing your pictures and family recipe with us! Thanks Shari . . . it was definitely a good summer for tomatoes! I’m already anxious to get going again for 2016’s gardens! What a beautiful way to prepare chicken. The colors look so vivid. Life in Italy is much different than the lives we lead here. I’ve planted a small garden this year. I don’t have time for more than that. We’ve gotten a few tomatoes and miniature eggplants. I appreciate it Annamaria! It’s nice to enjoy recipes that are not only full of flavor but also good for us! So hard to find! I have been hearing that from a lot of people!! Must be the year of the tomato 😉 This bruschetta looks just mouthwatering and amazing!! We must try it!! Perks for being “skinny”, I bet hubby wouldn’t even notice!! Thanks for this great opportunity to win the picnic basket and $175. I would buy more cookbooks! Love your recipes you have on your blog! This looks so delicious!, I am going to have to try and make this for hubby, I know he has been suffering because I am not that great of a cook and he is Italian loll,, Thanks for this yummy recipe. I am going to try the skinny bruschetta recipe. It looks delicious and just right for my diet. I always say, I think I was Italian in my past life because of my love for Italian food. Love the color and the presentation. Hope to try this one day. I hope that you try this to add to your love Italian food, Lux G. Easy, healthy, and delicious — especially with the freshest tomatoes that you can find! Your skinny-italian-bruschetta-chicken looks delicious. I copied down how to make it and especially the bruschetta. There are so many things you can fix with that!! Thanks for your giving me your thoughts about this easy summer recipe, Judy. I do apologize for replying back to you so very late, but life just sort of ‘happened’. Let me know what you do with this recipe and if you want I’ll add your photos and thoughts to this post! i have never been much for italian food but this skinny italian-bruschetta-chicken looks very good. it also looks very easy to make. i love all of the tomatoes. Thank you Sandy! Tomatoes are such a great ingredient for many kinds of foods. Hope you’re having a wonderful day and thanks for stopping by!